Using this tutorial you will encounter a few basic elements you need to get you engraving music as quick as possible. When you're moving the mouse over buttons you will see a description being shown on the status line at the bottom of the main window. In many cases a shortcut is shown between angle-brackets like this <F1> for function key F1. If you hold the mouse for a moment a hint-window will popup as well. Create a new tune using <ctrl-N>, [File|New] or (notice that there are often 3 possibilities: shortcut, menu and button). Now hit <+> a few times. You see the last inserted note moving up, sharps and or naturals are added where appropriate. The opposite will happen when hitting <-> (flats instead of sharps). Hit <Backspace> and see the last inserted note be removed. Click on button to choose 1/8 as default duration, and hit <Enter> until you see a bar line added.. Notice that flags and/or value lines added where necessary. Bar lines are added when a measure is 'full'. 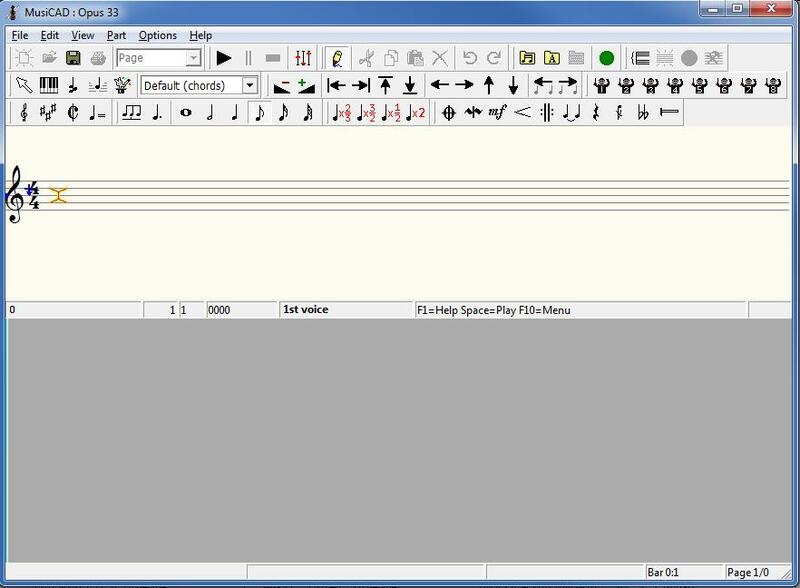 Press < > and view the cursor moving through the melody. < > alike. Use <F7> <F8> to divide or multiply duration by two, resulting in shorter or longer notes. Hit <F6> and then <F5>. A lengthening dot appears and disappears again. Use <r> <R> and again <R> Now you know how to enter a rest, and to change a rest into a note an vice versa. Click on the second note (to position the cursor) and then . Choose a bar line to your liking. You see how an upbar is entered. Click on the arrow near "chord-symbols" and choose 'Lyrics 1". Move the cursor to the third note and key in the text: "This is text" followed by <Enter> to signal you're done typing. This is a way to produce lyrics with your tune. Your screen should look like displayed below by now. When you hit a key unintentionally, most of the time an unwanted action will take place. Just hit <ctrl-z> or <alt-Backspace> or and the previous situation is revealed (undo). Hit <space> or to hear what you've entered so far. When you are done editing you hit the edit button or <Esc>. MusiCAD will verify your tune as keyed in so far, and display a page preview. See the frequently asked questions, tips, contents and visual help for more information.